No doubt by now you've seen horror stories about getting microblading done. 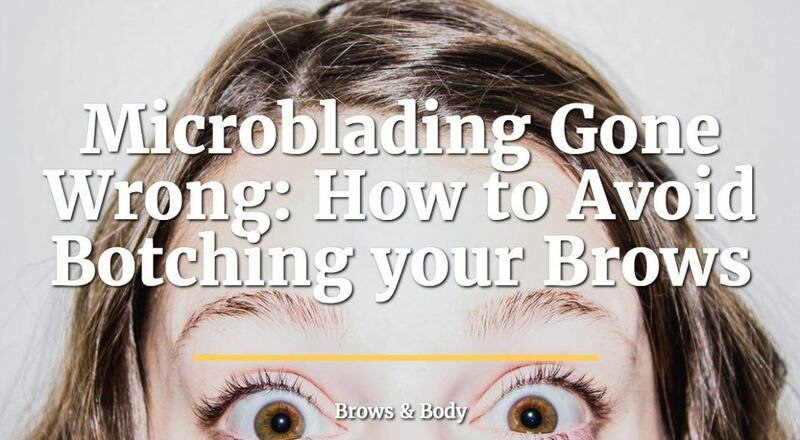 Articles about how microblading makes your skin fall off or how it causing permanent scarring have been circulating around the internet. Even though they may catch your eye, are they accurate? Is microblading really as dangerous as it sounds? Microblading, when done correctly, is actually quite safe (more than most procedures done by your Doctor). You just have to realize that microblading is a mini procedure and it should be taken seriously. Anytime the skin is opened (from ANY cause) there is a small risk of infection or some reaction. This is the nature of procedures. But with infection rates less than 1%, most people believe that this small risk does not outweigh the benefits from the procedure. We make these decisions all the time, most of the time without even thinking about it. Is it worth a small 1% risk of infection to get a mole removed, even though it will help improve your self-confidence? Is it worth a small 1% risk of infection to create the perfect brows for you, reducing the amount of time it takes to get ready in the morning? If the answer is yes, then you will most likely get the procedure done. There is one potential problem with microblading that we do need to discuss, however. And that is the fact that many artists are not necessarily trained properly on how to keep a safe and sterile workplace and how to properly sanitize their equipment. Not taking care of these aspects can and will increase your risk of infection and will increase the risk that you get a botch job. The good news is that you can take steps to PREVENT this from occurring, which is what we will discuss next. Is it possible to prevent a botch job when it comes to your brows? YES, and you should take every precaution to make sure that you do. You NEVER want to increase your risk of an infection or some other negative side effect when it comes to your face. After all, it's easy to hide a scar on your back or chest, but it's much more difficult to hide a scar directly on your face. Let's talk about steps YOU can take to prevent a botch job. The first and most important thing that you should do is to research your artist like crazy. If there is any question as to whether or not they are skilled or know what they are doing then you shouldn't get your brows done by this person. Not all microblading training courses are created equal which leaves many artists not as skilled as they should be. You can find out if your artist is skilled by simply looking at their Instagram or other social media accounts. If they don't have a significant amount of before and after pictures then you can assume that they are probably fairly new to the game. Also, make sure you look for unbiased reviews from some source which doesn't allow review manipulation. Facebook, Yelp, google reviews, etc. should all work for this. The best case scenario is that you go to an artist which was personally recommended by someone you know. #2. Avoid Going to a "Newbie"
This is really an extension of #1, but make sure you don't go to someone who is brand new. If you find someone offering you a deal that seems too good to be true, it may be because this person doesn't have a large clientele yet. Avoid Groupon/living social coupons and avoid people who don't have an extensive portfolio of before and after pictures. This is a no-brainer, but still worth discussing. Most of the equipment that a microblader uses is either disposable (one-time use) or needs to be sanitized appropriately after each use. This part is fairly straightforward, so you'll also want to make sure that your microblader is practicing appropriate hygiene during the procedure as well. Gloves should be used at all times and a mask as well. This helps reduce bacterial exposure to the open wound on your face from breathing and from normal skin flora. Your microblader should also take caution not to contaminate sterile workspace with improper sterile technique. All Doctors and nurses are trained in this techniques, but microbladers must take extra courses to learn this information. You can always ask before your procedure if they are familiar with the proper sterile technique and if they've taken blood born pathogen courses. Another common reason for complications after microblading is due to the dye found in the microblading pigment. Some people can be allergic to this dye which causes an inflammatory reaction in the face. This reaction is what you see in most of the microblading gone wrong horror stories. The inflammatory process makes the skin look very red and very angry, but it's often not as bad as it looks. Byproducts such as Nickel may be contained in the microblade dye which can trigger this reaction. The reason it looks so bad is that the body attempts to get rid of the pigment by causing the inflammation which makes the skin very red and puffy. This can completely be avoided by asking each person if they have any known allergies prior to the procedure. If there is any question, or you aren't sure if you are allergic, then you can start with a tiny "test patch" of skin before you undergo the entire procedure. If you do have an allergic reaction to the dye then the only way to stop the reaction is to get rid of the pigment. As long as the pigment is inside the skin it will continue to cause problems. You can learn more about how to fade your microbladed brows here. The most serious consequence of microblading and the one that you want to avoid is from an infection. Infections can trigger an inflammatory reaction and increase the risk of scarring if they aren't dealt with in a timely fashion. Like I mentioned previously, there is always a risk of an infection whenever the skin is opened, but this risk can be minimized with proper sterile technique (discussed above). If you can prevent an infection then you can prevent scarring or other issues from getting microblading done. This means following the after-care instructions from your artist to a "T"! If you keep the skin clean and don't touch it with your hands then you will minimize bacterial exposure and reduce the risk of infection. If you do think you have an infection then you can and should reach out to your artist and ask what his/her procedure is. Most of the time you can get rid of the infection with topical antibiotics, but occasionally you may need a Doctor visit for oral antibiotics. If you think something is wrong do NOT be afraid to reach out to your artist! Every day I see people who reach out to me here on this website asking for advice when they should be talking directly to their microblader. The person who did your job knows your skin and knows what happened to your skin and ultimately they are responsible for your brows. If you are worried about the shape of your brows then talk to your artist to see if it can be fixed during your touch-up. If you are worried about the color or the size of your brows then ask your artist if this can be fixed in your touch-up as well. If you are worried about redness or swelling reach out to your artist and ask if they have any advice. If you think there is an infection then you may want to skip your artist and go straight to a Doctor. If there is any question in your mind as to what is happening to your body or your face then your next step should be to see a Doctor. This is obviously not a problem if your brows are just too big, blocky or the wrong color, but this is definitely a consideration if you think you are having an allergic reaction or if you have an infection. Unfortunately, sometimes your Artist may not know how to proceed which means you may have to seek the attention of a Doctor. Medications such as a steroid, anti-inflammatory medications or antibiotics may be necessary to treat allergic reactions or infections and these are not something that your artist can supply you with. This is definitely a RARE occurrence, but it can happen, so keep it in the back of your mind. What are you supposed to do if you experienced a botch job with your brows? If it's an infection or an allergy then your only option is to get treatment (either from a Doctor or with topical medications). But what if your problem has more to do with the size, shape or color of your brows? The first thing you should do is NOT panic. In most cases, you can actually treat and fix the problems mentioned above in your touch-up, but the hardest thing you'll have to do is exercise patience while you wait! During the touch-up, your microblader can alter the color of your brows, the size, and even the shape. So if this is your main problem then discuss your options with your artist. Another option is to simply bypass your current artist and seek a second opinion from another, more experienced, microblader. Sometimes you don't know that you're dealing with an inexperienced microblader until AFTER the procedure. You may know that you don't want to wait for the touch-up and you don't want to go back to your original artist. If you fall into this category then you may want to find a more experienced microblader and have them fix the issues that were created in the first place. Your final option is to "start over" by rapidly fading your brows. You can do this by taking certain steps (outlined here). After your brows have faded (remember that microblading is semi-permanent), you can either opt to have your brows done again or just forget the whole experience and stick with what you have. Microblading isn't necessarily more dangerous than your run of the mill procedure as long as proper steps are taken. Before you get your brows microbladed make sure that you follow the steps outlined in this blog post and you will be on your way to LOVING your brows for a long time. Have you had a bad experience with microblading? Were you able to correct your brows afterward? What happened to your brows? Was the color off, was it your shape, was it the size of the brows?